There are many different systems for classifying and labeling chemicals in the world, which causes confusion, potential errors and misunderstandings among workers and consumers alike. This was primarily due to exposure to differing forms of labeling and safety data sheets in different countries. Thus, the United Nations developed a Globally Harmonized System for the classification and labeling of chemicals, known as GHS. As an international agreement GHS is non-legally binding in Europe, therefore the GHS criteria was introduced into Europe via CLP. NEW! The 4th revised version of UN GHS was released on 8 Sept 2011. CIRS has summarized the differences between the 4th revised UN GHS, CLP regulation and China GHS. For more info, please click here. The CLP Regulation will replace Dangerous Substances Directive 67/548/EEC (DSD) and Dangerous Preparations Directive 1999/45/EC (DPD) in a stepwise approach during a transitional period. On 1 June 2015, both directives will be fully repealed. For example, before 1 Dec 2010, a substance shall be classified according to DSD. CLP classification is optional. Between 1 Dec 2010 and 1 June 2015, a substance shall be classified according to both DSD and CLP. Both classification shall be given in Safety Data Sheet and communicated down the supply chain. 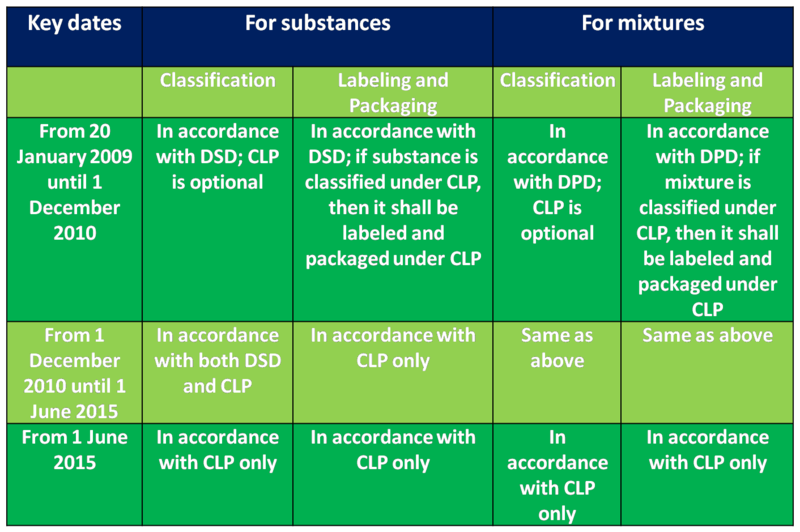 After 1 June 2015, a substance shall only be classified according to CLP. Generally speaking, companies shall classify substances or mixtures, submit C&L notifications to ECHA, and label and package their products in accordance with the CLP regulation. 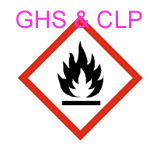 CLP compliant Safety Data Sheet containing the CLP classification and labelling shall also be prepared and communicated to downstream users. However, not all chemical companies are required to do all above four things to achieve CLP compliance. Click here for find out what your obligations are under CLP. Note : The most urgent thing for companies to do at the moment is to submit C&L notifications to ECHA because the deadline is 3 Jan 2011. ECHA has indicated in its FAQs that if you missed C&L notification deadline, you shall notify without any delay to avoid legal penalties. You can avail of our CLP notification service by using our application form. Note 2: Polymer is not exempt under CLP. More info about how polymers are regulated under REACH & CLP can be found here.